Rhett Butler is the founder of Mongabay.com, an environmental science news web with a focus on tropical forests, now celebrating 10 years on-line. Butler is also co-founder of Tropical Conservation Science, an academic journal that aims to provide opportunities for scientists in developing countries to publish their research in their native languages. He has written for BBC News, Washington Monthly, Trends in Conservation Ecology and other publications. In this program, he describes to Dr. Caldicott the threats currently facing the world’s rainforests, which play a key role in reducing global warming. At the start of the interview, Butler speaks about how his childhood exposure to nature and world travel inspired his passion to preserve rainforests. As he and Dr. Caldicott begin to look at rainforests, they first look at the current situation for forests and animals in Madagascar, where 80% of the country’s native plants and animals, such as lemurs, are found nowhere else. Lemurs are now threatened by the new trade in lemur bush meat. Read Bushmeat trade threatens Madagascar’s rare lemurs. The show then examines logging in Australia, Indonesia and elsewhere. Butler mentions the new initiative, REDD (Reducing Emissions for Deforestation and Degradation), a plan for governments to be paid for keeping forests standing which has already had some successes. See the new Seed magazine article Forests for the Trees: Five experts discuss paying countries to keep forests intact, what role carbon markets should play, and how to protect the people whose lives depend on trees. For more on REDD, read Are we on the brink of saving rainforests? and Investing in conservation could save global economy trillions of dollars annually. They then discuss the notion of carbon offsetting to reduce greenhouse gases, a solution Dr. Caldicott considers worthless. Dr. Caldicott reads from one of Butler’s articles, Brazil’s Plan to Save the Amazon Rainforest, in which he elucidates how global deforestation is a greater source of greenhouse emissions than cars, trucks, and airplanes. The Amazon rainforest, located in several South American countries, regulates global and regional climate, and as Butler notes, cutting down rainforest in Brazil negatively affects ranching in Texas. Read UN URGENT: End Deforestation, Conserve World’s Forests. They next explore the fate of native peoples in rainforests around the world, some of whom are manipulated by logging companies in terrible ways. Dr. Caldicott relates her experience visiting the Brazilian rainforest, where she encounteried indigenous tribes. This journey is described more fully in her book If You Love This Planet, a new edition of which is published this month. For more on forests and native peoples, read REDD may harm forest people, alleges report and Carbon conservation schemes will fail without forest people. Also see Adaptation Of Forests And People To Climate Change – A Global Assessment Report. Butler enumerates which industries have been chopping down the Amazon rainforest, including cattle ranching, soy farming and gold mining. He says the 2009 Greenpeace report, Slaughtering the Amazon, which fingered major corporations which destroy the rainforest, has had a major positive impact. Many companies have drastically altered their behavior in the wake of the report. Read Shoe Brands Get Tough on Leather Suppliers to Save Amazon Rainforest. Butler speaks about the Peruvian rainforest, where over 30,000 indigenous Peruvians stood up earlier this year against energy companies that want to exploit the rainforest. Butler says that 70% of the Peruvian Amazon rainforest has been allocated for oil and gas exploration. Chevron has been sued for its practices in the Ecuadoran rainforest. For more background, visit the website of the Amazon Defense Coalition and read Mongabay articles Oil Extraction: The Impact of Oil Production in the Rainforest, Chevron expects to lose $27B suit but will refuse to pay damages and Oil development may destroy richest part of the Amazon rainforest. Also read Butler’s September 3, article Amazon tribes have long fought bloody battles against big oil in Ecuador. See the September 6 news article Chevron Awaits Verdict in Environmental Damage Case. 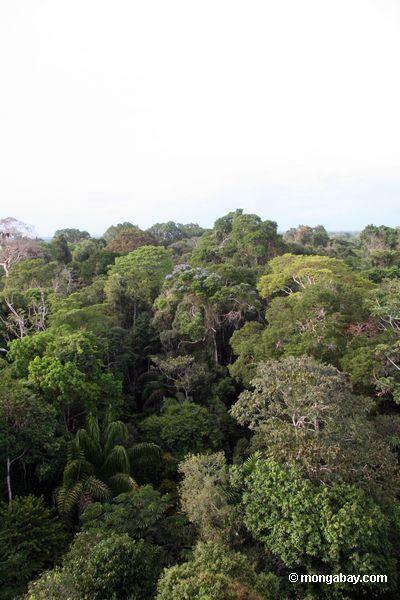 Brazil, Butler says, is making some good progress toward preserving its rainforest, with Brazilian leaders committing to raise significant money to save the forest. There has been concern that the government would continue to side with loggers and cattle ranchers, as stated in a June article at the time Slaughtering the Amazon was released, The Amazon is Dying: The Brazilian government is legalizing deforestation and western superbrands are benefiting from it. This needs to stop now. Butler and Dr. Caldicott look further at the escalation of global warming that would occur if the Amazon rainforest is destroyed. She describes the relationship between burning trees and rising global temperatures. Butler is asked about soy companies’ role in rainforest destruction, and he points to another significant Greenpeace report, Eating up the Amazon, which came out in 2006 and helped force soy companies to change their practices. Dr. Caldicott brings up the topic of palm oil, and they look at the enormous growth in palm oil production from palms grown in areas cleared of rainforest. They examine which companies and which products are using palm oil, and how palm oil is used to produce biodiesel fuel for China. Butler notes that over 10 million hectares of palm oil farms have been planted in the rainforest. 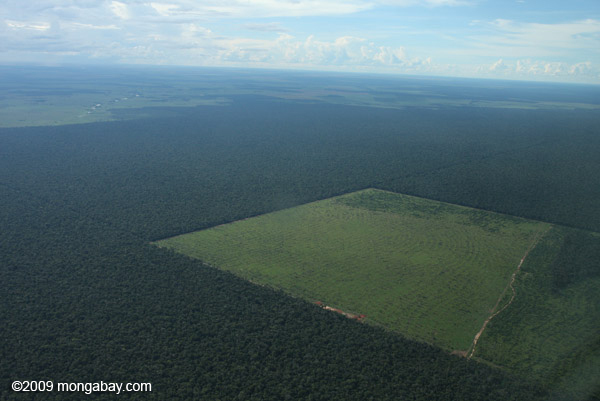 Read Is oil palm the next emerging threat to the Amazon? See the September 11 Friends of the Earth press release Environmentalists Welcome World Bank President’s Halt to Palm Oil Investments. Also read the September 2009 Mongabay article Palm oil paradox: a leading threat to orangutans and a key source of jobs in Sumatra, in which Butler interviews three experts on palm oil and saving orangutans. Near the close of the program, Butler emphasizes the importance of compensating countries to save forests, which are often devalued when they remain living entities. He says that “smart people” are also working on building awareness that intact forests will retain more of the world’s water supply in the future, when water scarcity is expected to increase substantially. Dr. Caldicott in her closing remarks underlines the importance of rainforests, and all trees, in abating global warming, and says the rainforest issue is really about “the fate of the Earth.” Listen to this program and keep abreast of rainforest news on Mongabay.com and the Rainforest Action Network website to get the full picture. This entry was posted on Monday, August 31st, 2009 at 12:00 am	and is filed under Uncategorized. You can follow any responses to this entry through the RSS 2.0 feed. Both comments and pings are currently closed.